OTTAWA - The Lac-Megantic train disaster prompted a flurry of political manoeuvring Tuesday as the Harper government issued emergency rail directives just hours before Conservative MPs led a move to nix House of Commons committee hearings into the catastrophe. A senior Transport Canada bureaucrat, meanwhile, refused to discuss an internal memo from his own department that said it saw "no major safety concerns" with the push to move more oil by rail, nor with the safety of tank cars. 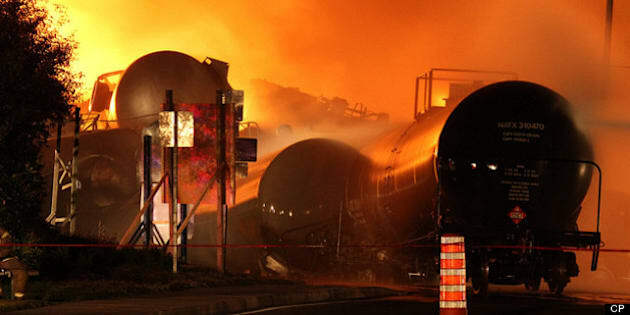 Tank cars filled with oil exploded after a Montreal, Maine & Atlantic train began rolling and derailed in the small Quebec town of Lac-Megantic on July 6, claiming an estimated 47 lives. Under the new measures outlined Tuesday, at least two crew members must work trains that carry dangerous goods. In addition, no locomotive attached to one or more loaded tank cars transporting dangerous materials can be left unattended on a main track. The Transport Canada directives take effect immediately. The department is giving rail operators five days to ensure that all unattended locomotives on a main track or sidings be protected from unauthorized entry into the cab. The announcement came as MPs on the House of Commons transport committee prepared for an emergency meeting to talk about rail regulation. As the session opened, NDP transport critic Olivia Chow proposed the committee sit in August to study existing rail safety recommendations from watchdogs, producing a report in October. The committee could focus on the Lac-Megantic disaster once the Transportation Safety Board has issued its findings, she said. "There is absolutely no reason for us to wait," she told fellow committee members. But Conservative members moved to forestall a committee study of rail safety, saying it was too early. The investigative resources of various agencies are best used at the accident scene now, not at a Commons committee, said MP Jeff Watson. "The answer from this side of the table is not a No," he said. "It's a Not yet." One Conservative MP went further, accusing the NDP of playing "cheap political games" with one of the worst tragedies in Canadian history. "I say the NDP lacks any shame and common decency," said MP Mark Adler. Liberal MP David McGuinty backed the Conservative move to delay any committee hearings, saying there were already nine current or prospective inquiries into the derailment and it might be premature to pull experts away from more pressing work. It's unfortunate the Conservatives wanted to "take the summer off," Chow said after the meeting. "It's quite disappointing. Am I surprised? No." Following the disaster, the federal Transportation Safety Board — which is still investigating — asked for initial changes in regulations governing rail traffic. — the automatic brake is set in full-service position and the independent brake is fully applied for any locomotive attached to one or more cars left unattended for one hour or less on a main track or sidings. The emergency directives will be in place until December. In the meantime, Transport Canada will ask railways to develop formal rules that reflect the directives. "The disaster brought to light several industry practices which have caused some concern," said Gerard McDonald, assistant deputy minister of safety and security at Transport Canada. "Given that, and with an abundance of precaution, we thought it would be prudent to implement these measures now," he told a hastily organized conference call with reporters. However, McDonald wouldn't discuss what may have gone wrong in Lac-Megantic. "I'm not going to speculate on the causes of the accident. I don't know what they are." McDonald also refused to comment on a May 2012 Transport Canada memo that said the department had "identified no major safety concerns with the increased oil on rail capacity in Canada, nor with the safety of tank cars that are designed, maintained, qualified and used according to Canadian and U.S. standards and regulations." The memo, obtained by Greenpeace Canada under the Access to Information Act, was prepared for then-transport minister Denis Lebel, shuffled out of the portfolio earlier this month. Transport Canada says it has been in contact with the railway industry and the Railway Association of Canada to work on safety of the rail system. Fifty organizations from across Canada are calling for several changes, including a ban on shipping oil in older DOT-111A tanker cars and a broad review of all means of transporting oil, including pipelines.